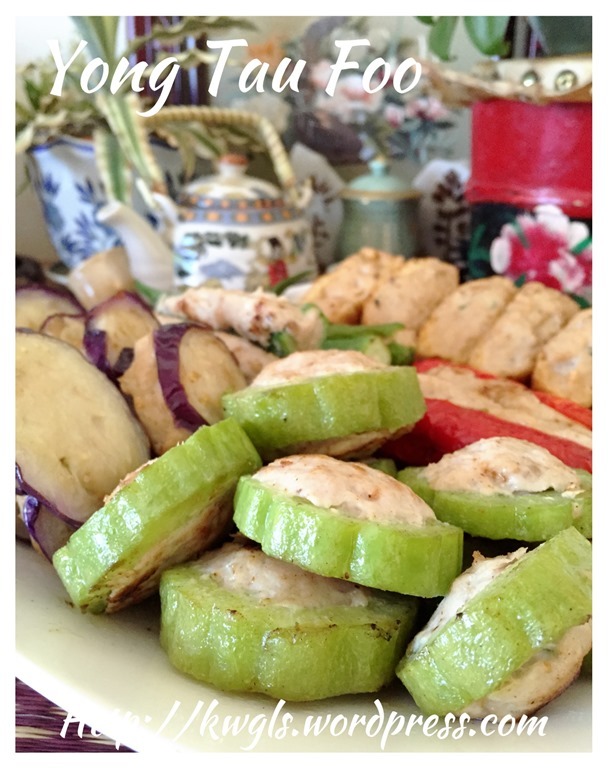 There are many ways of serving Yong Tau Foo . In Singapore, it is very common that Yong Tau Foo was served in a soupy form together with the noodles. Some sweet sauce was used as a dip. 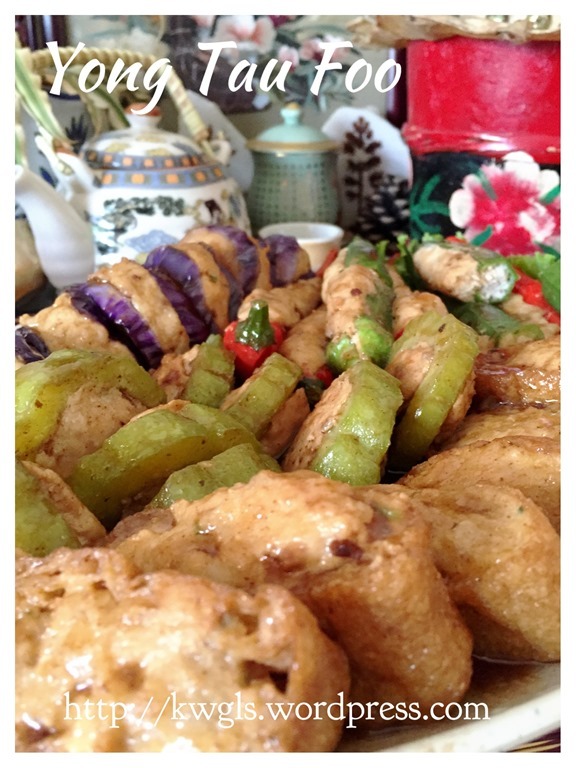 In certain store, it was served with curry gravy making it a curry Yong Tau Foo.. 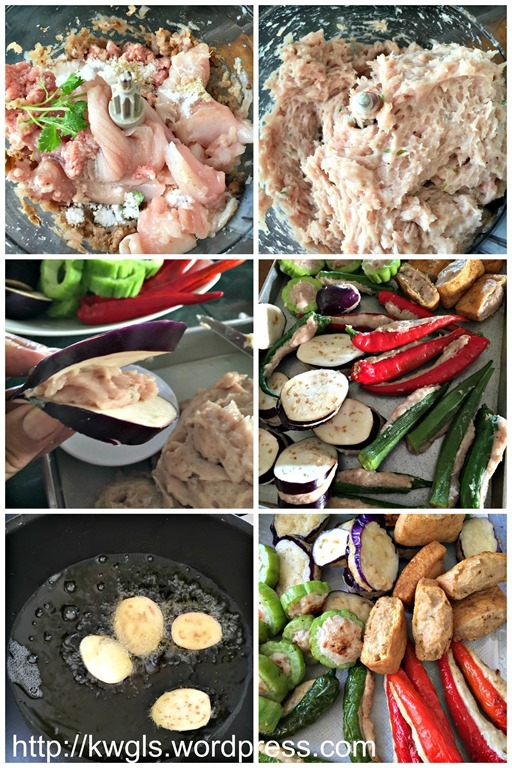 In Singapore hawker stalls, most of the Yong Tau Foo was stuffed with fish paste and that make many people “assumed” that Yong Tau Foo was seafood based. 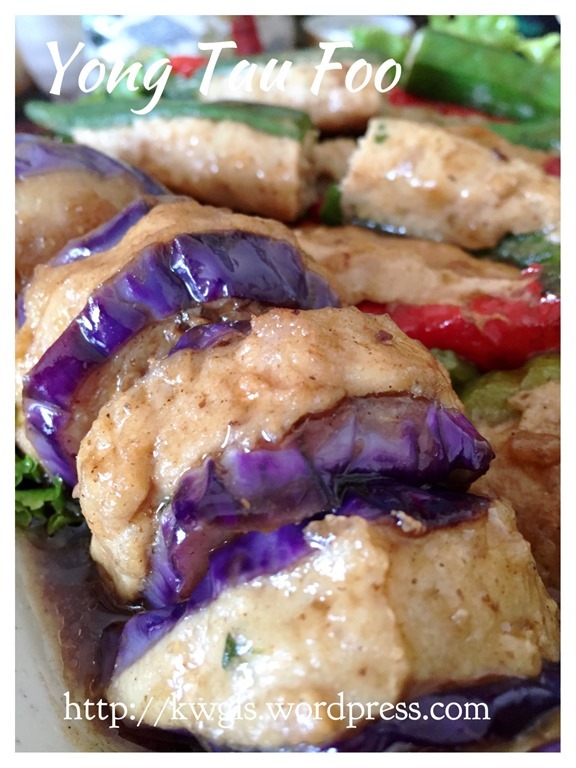 In fact it is not, most Chinese recipes in China and Malaysia do call for the usage for both meat and and fish possibly in the ratio of 50%:50%. 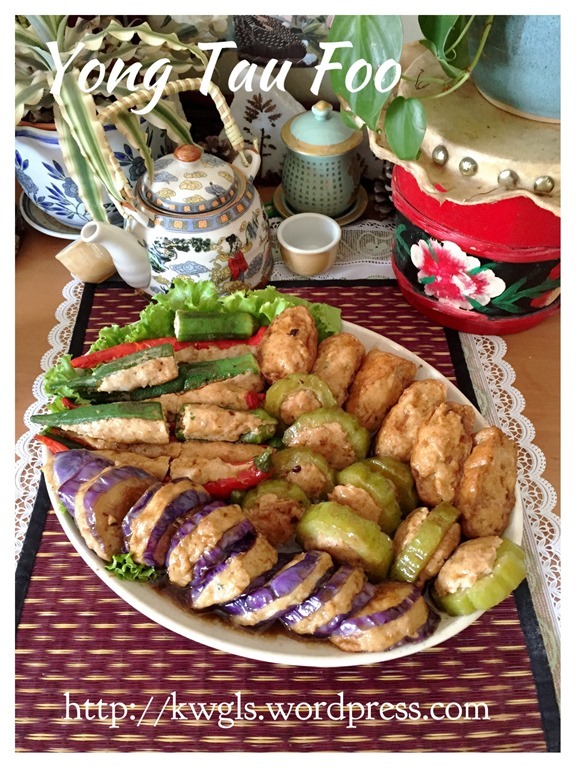 The more authentic Hakka recipes will call for the usage of salted fish that will flavour the paste used for stuffing. 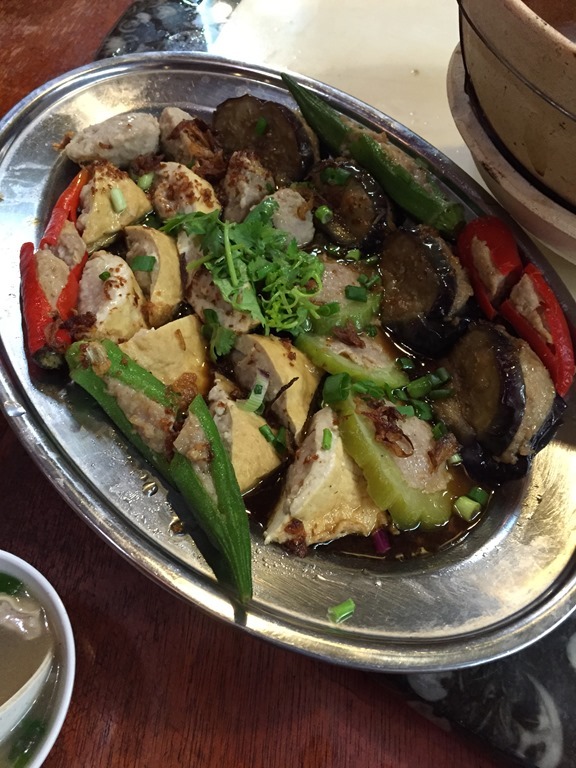 In China, most of the Yong Tau Foo was meat stuff in firm bean curd or taukwa. 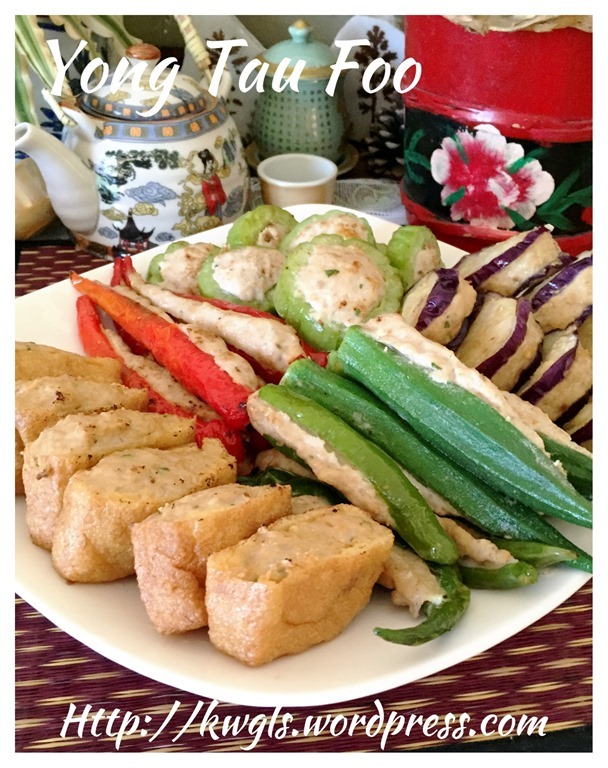 Basically it is as what is implied in the name “ Yong Tau Foo”. . Yong Tau Foo can literally be translated as stuffed filling into a piece of bean curd product be it bean curd skin (tofu skin) or bean curd puff . 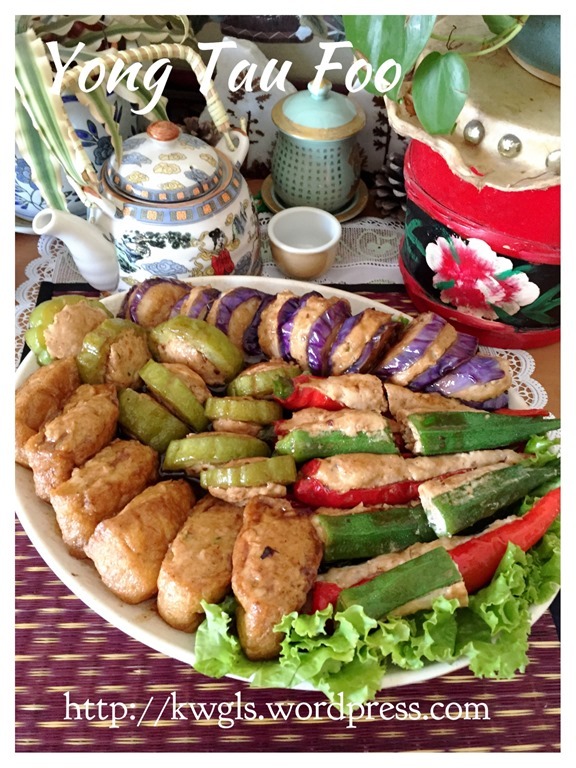 However, in Singapore and Malaysia, besides taukwa or taupok, vegetables are used. 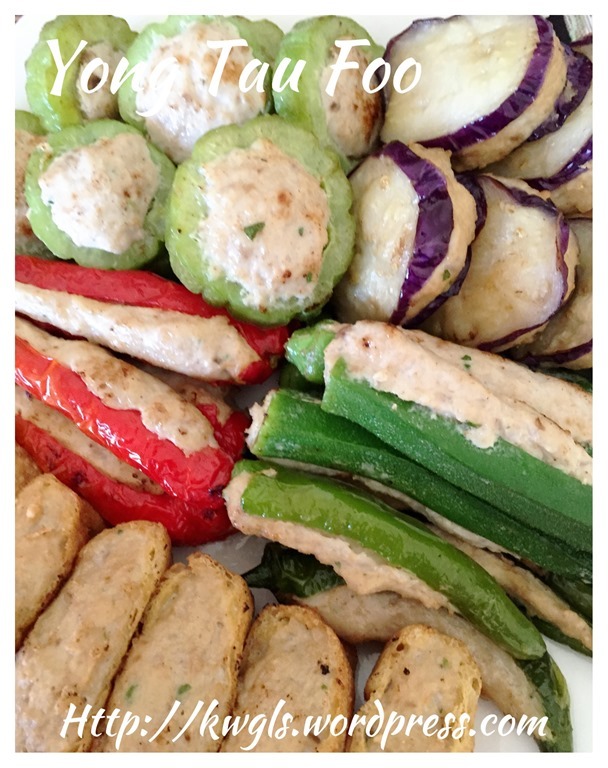 Usually, vegetables selected are those that have a cavity that you can stuff the fillings. The more common one will be bitter gourd, egg plant, red chilli, green chilli, shitake mushrooms and ladies finger. All quantities above is for reference and it will depend on your family preference. Blend all the filling ingredients until fine using a food processor. 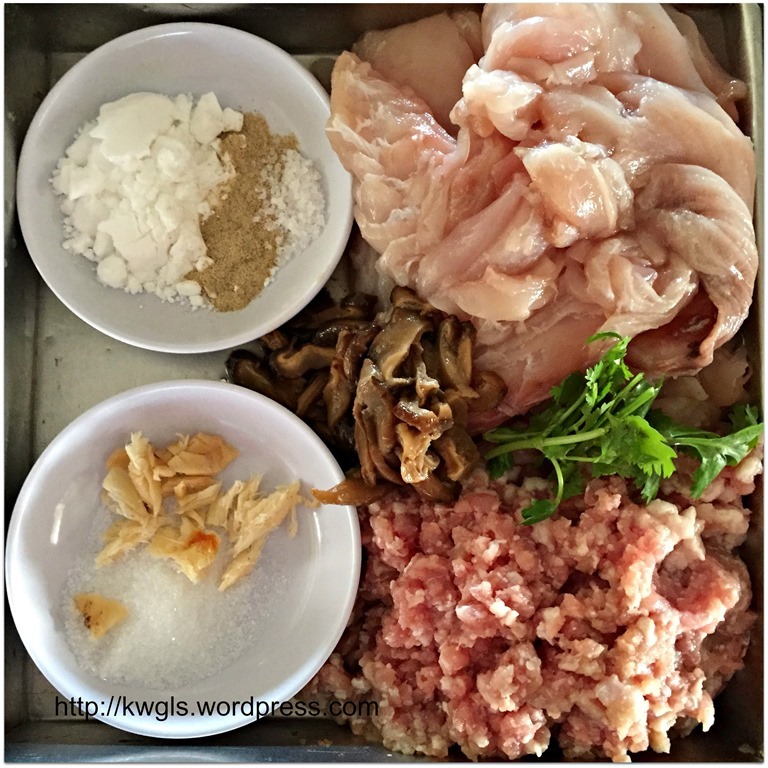 If you do not have a food processor, you can also use a knife to chop until fine. Use a spoon or a knife, take some filling and stuff into the vegetable cavity. Make sure the fillings are full and firm. 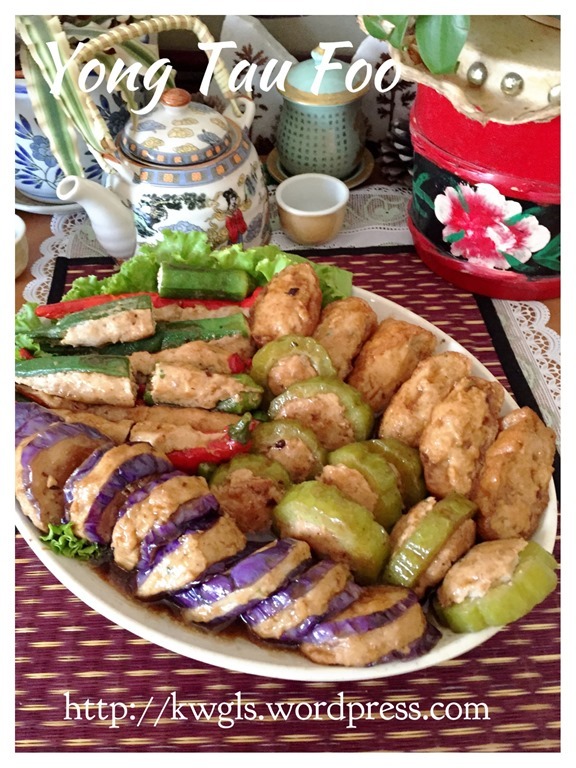 In a pot of hot oil, deep fried the vegetable until the vegetable are slightly soft and meat are cooked. Drain and set aside. 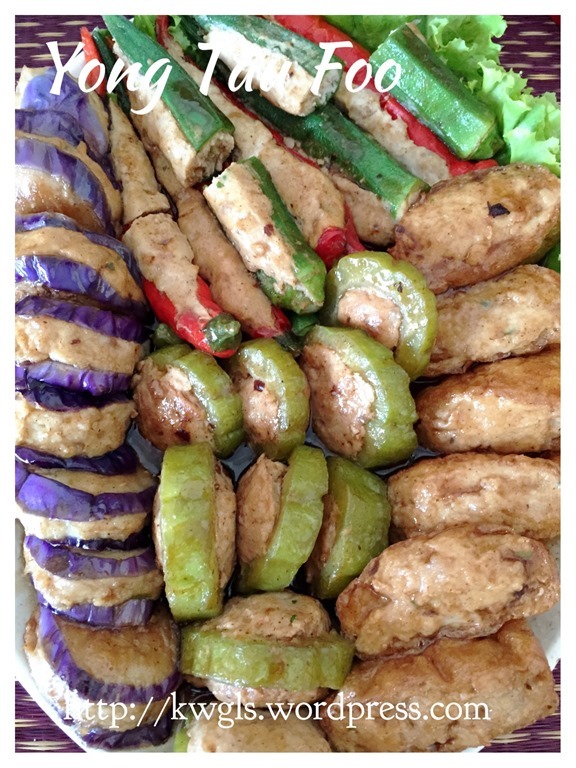 It is advisable that your deep frying be done in stages in accordance to the type of vegetable . Different vegetable have different cooking time. 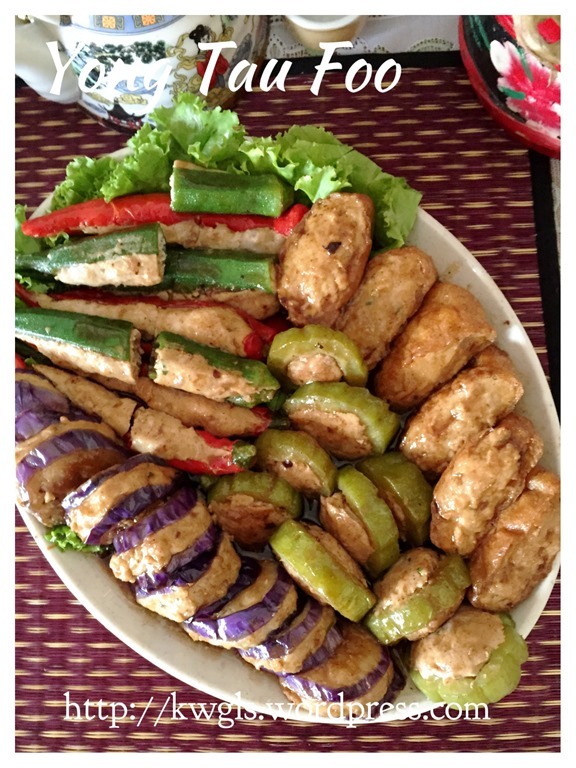 The ranking of cooking time from longest to shortest shall be : Bean curd (taukwa), bitter gourd, egg plant, chilli and ladies finger. As we will be braising later, the deep frying can be considered done as long as the meat are cooked which is relatively fast (about 3-4 minutes). In a pot or a wok, have some cooking oil, sauté the garlic until fragrant. 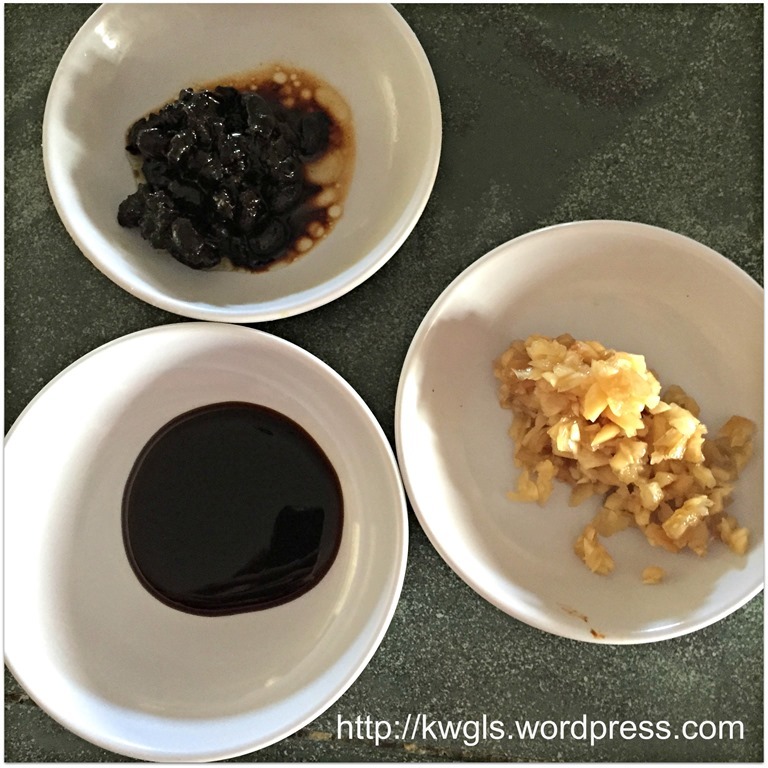 Add the fermented black bean followed by adequate water to cover the Yong Tau Foo (start with 1 cup and gradually add). Add oyster sauce and sugar, bring to boil. Add the deep fried Yong Tau Foo. Let it simmer for about 10 minutes. After 10 minutes. 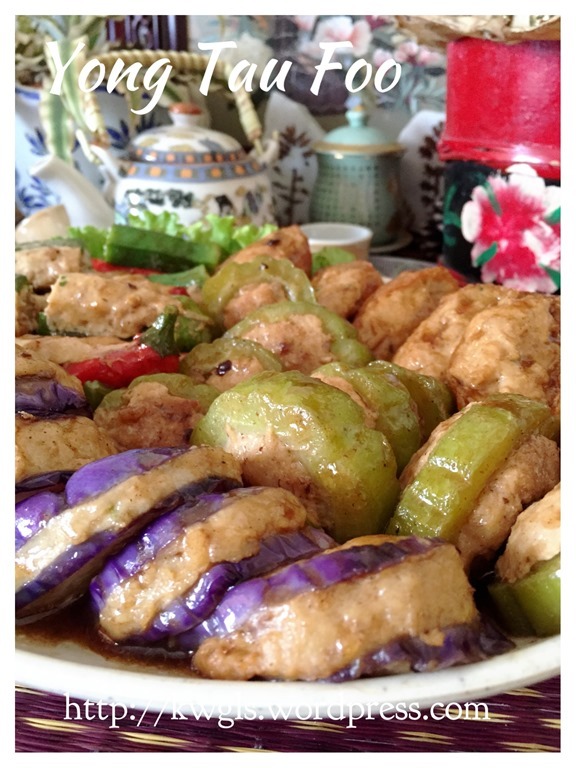 Transfer the braised Yong Tau Foo to the serving plate. Add corn starch solution to the gravy and when the sauce thickens and become transparent, off the heat and drizzle the sauce on top of the Yong Tau Foo before servings . The basic recipe is shared with all and variation are many. 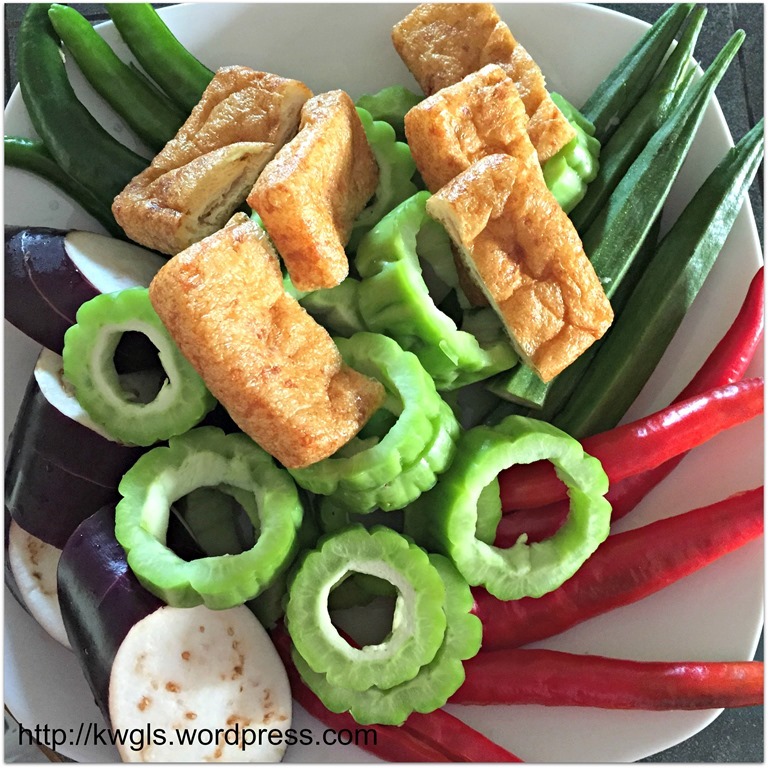 If you do not like deep frying, you can try steaming until all the vegetable are soft.. If you do not like the braising method, you can boil a pot of stock using soya beans and anchovies, served the Yong Tau Foo with this delicious soup. Otherwise, prepare some curry sauce to go with this. If you have never try this way of preparation, why not give it a try? 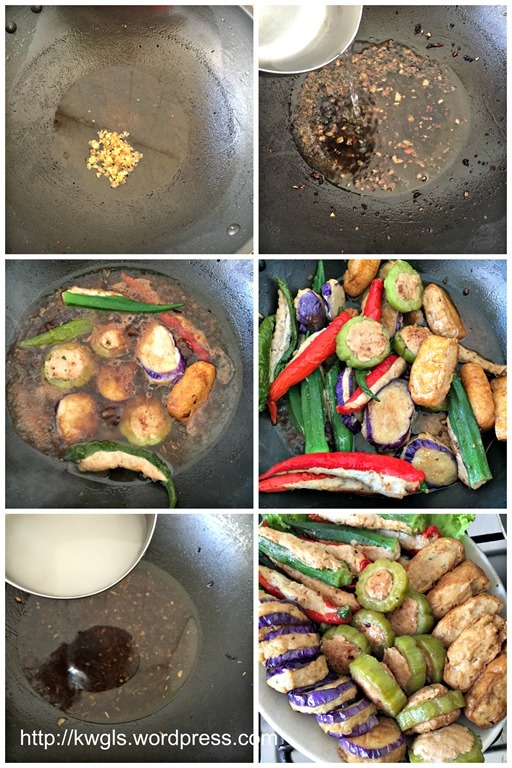 This entry was posted in Dish, Food Preparation Series and tagged 8, 酿豆腐， HAKKA DISH, GUAI SHU SHU, Guaishushu, POSTADAY， kennth goh, yong tau Foo. Bookmark the permalink.